I attempted to cut a pinion gear again, with no luck. 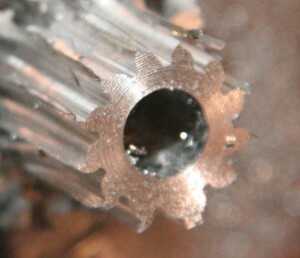 I’m using a 24 pitch 14.5o involute gear cutter on a Sherline gear cutting arbor. 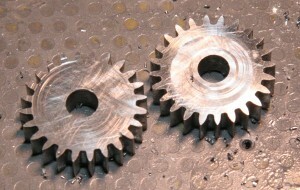 I want to cut a 12 tooth gear. 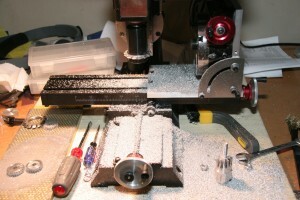 I turn a 3/4″ round bar stock down to 37/64. Cutter width = 15/64, half = 1/8. The radius of the blank is 19/64. I much be sloppy somewhere and am just missing it. These will eventually be the cord engagement gears. I need to mill the 1/8 grove which will capture the cord. As you can see the teeth aren’t formed correctly. This is actually the 3rd attempt. On my first attempt I accidentally attempted to cut 24 teeth instead of the 13 I was shooting for. I decided the second attempt to cut 12 teeth because it divided cleanly, but forgot to adjust the blank diameter. The third attempt, it looks like I forgot to center the cutter, so it is off… Too late to start a new blank, so left for another night. During the Seattle robotics meeting, I ‘crossed the streams’ (reverse polarity) and destroyed the motor controller (and presumably the motor, don’t want to take changes). 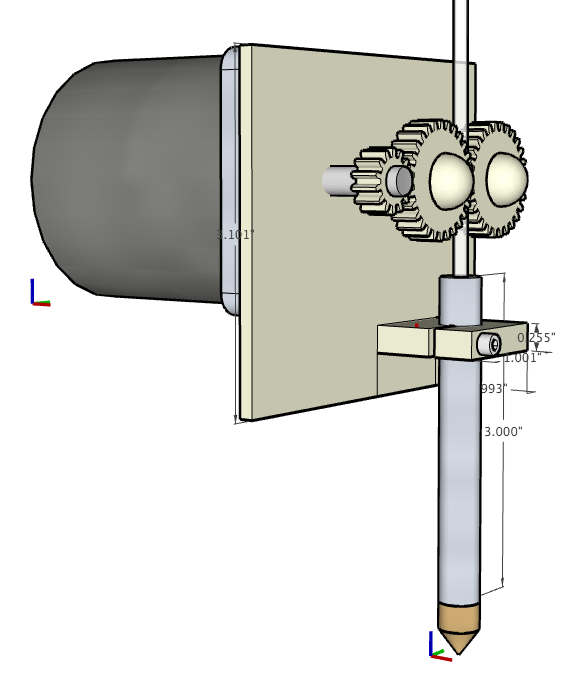 Given that I wanted to standardize on the 12v motors I was using for the Axis, this seemed like a good time to incorporate this motor into the extruder. While building the new motor mount, I decided to look into a different type of extruder drive, similar to the pinch pulley, but built with gears. Two drive gears have a 1/8 channel milled into them. The gears with the channel ‘capture’ and hold the plastic cord. I wasn’t sure how long the urethane pulley would last, so this is an experiment. You are currently viewing the archives for October, 2008 at OoeyGUI.